January 26, 2013 — Don Mullen first learned about the Church of Jesus Christ of Latter-day Saints as a kid growing up in the Texas panhandle. These days, he leads a contingent of over 200 LDS missionaries serving in the Idaho panhandle, Eastern Washington, Northwestern Montana and a small portion of Canada. Pres. Mullen and his wife, Melonie, arrived in Spokane last June, taking over for Pres. Mark Palmer and his wife, Jacqueline, as they concluded their three-year calling in the Spokane, Washington Mission. The Mullens left their home in Orem, Utah to report to the Inland Northwest. Don and Melonie Mullen moved from Orem, Utah to Spokane last June to begin a three-year calling in the presidency of the Spokane, Washington Mission. Photo by Craig Howard. Sis. Mullen said the transition to Spokane and the mission presidency has been part of a natural progression. A native of the Salt Lake Valley who grew up in South Jordan and Granger, Sis. Mullen echoed her husband’s thoughts about moving to Spokane. The couple resides in the Belle Terre Ward of the Spokane East Stake. Pres. Mullen grew up in Borger, TX., site of the Lone Star state’s first panhandle oil well in 1921. His father worked as a petroleum engineer at a Phillips Petroleum refinery outside Dumas, TX. When Pres. Mullen was a child, his parents learned of the LDS Church through a pair of full-time missionaries. They were later baptized and attended a small branch in a rented building. The Mullens met while students at BYU and were married in 1987 in the Salt Lake Temple. Photo by Craig Howard. When Pres. Mullen was 7, his family moved to Idaho Falls a city with a significant LDS population. He grew up there and graduated from Idaho Falls High School in 1973. In 1975, he embarked on a two-year, French-speaking LDS mission to an area covering Belgium, Northern France and Luxembourg. Don and Melonie met when both were students at Brigham Young University. They were married in the Salt Lake Temple in 1987. The Mullens are parents to five children. Their twin sons, Nathan and Jordan, relocated to Spokane with their mom and dad and are seniors at Central Valley High School. Their daughter, Andrea, attends Utah Valley University. A son, Ryan, served a mission to Hungary, is now married and currently attends BYU. The oldest, Meghan, is also a student at BYU, served a mission to Romania and is engaged to be married this March in the Spokane Temple, just a mile or two from where her parents now live. As for the rigors of serving in a mission presidency, the Mullens say the reward is well worth the work. Pres. Mullen said his favorite part of being a mission president is serving with his wife. The Mullen family includes two daughters, Andrea and Meghan, a daughter-in-law, Marissa, and three sons, Nathan, Jordan and Ryan. Photo by Craig Howard. Pres. Mullen expressed appreciation to all those who have formed the foundation for the current efforts to share the restored gospel in the area. His only regret has to do with the span of the calling. Sis. Mullen, who oversees medical issues throughout the mission, says the calling presents many opportunities for growth, including numerous speaking engagements at stake conferences throughout the region. The Mullens say they have formed quality friendships in the seventh months they have lived in the area – both with their LDS and non-LDS neighbors. Sis. Mullen – Speak, don’t be afraid. Trust in the Lord that he will make your awkward words be what they need to be and will touch those who are seeking and prepared for truth. Trust the Lord. I think of it as ‘He will change my words to be what they need to be,’ so just say it! Pres. 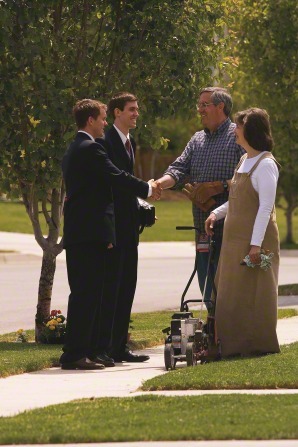 Mullen – The First Presidency message in the February 2013 Ensign – “A Word for The Hesitant Missionary” by President Uchtdorf and the First Presidency Message in the Sept 2012 Ensign – “Sharing the Gospel Heart to Heart” by President Eyring are both must-read articles about how to be member missionaries. These are like “Missionary Work of Members Made Easy.” They contain great insights and simple suggestions of how to start. 1- Just keep doing what you are doing. Others see the goodness in you and in your families. As you are Christlike and give Christlike service, those around you see that and want that for themselves. 2-Open your mouth – just talk to others in a normal, natural way. You can talk about things you did at Church or that you like about the gospel in a non-pushy, natural way. This will often lead to questions and more discussion about the Church and your beliefs. 3-Be kind and gracious to your family and others. 4-Pray for missionary opportunities then look for them – Don’t be afraid to act when you get what you prayed for – we don’t know who the Lord has prepared to hear the gospel – but the Lord knows who he has prepared. 5-Trust God that when you do your best, He will always make up the difference.